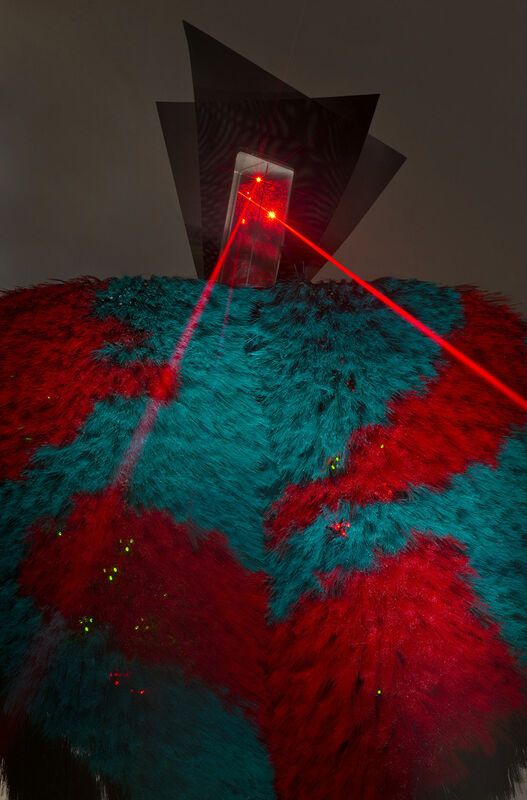 Liliane Lijn (b. 1939, New York) started as a young artist within a male world of kinetics and conceptual art. The kind of work she has become known for, as the result of being affiliated openly and consistently with artists that deal with space, light and matter stands bold and fresh today still. Though it is language, through poetry and myths, that have lead her work and her philosophy throughout and have been the connecting matter in all her work. Making what might seem small leaps in developing a language of her own, work after work, Lijn has never stopped experimenting and pushing the limits of her practice. Merging science, technology with poetry, writing and performance, sculpture, video and painting she has built throughout the decades a very dense and coherently diverse corpus. She has always been an ‘un-feminist feminist’, dealing with fields uncanonical to feminism, like science and technology. Liliane Lijn, The Lady of the Wild Things, 1983. Courtesy Rodeo Gallery. Since our collaboration began and Lijn joined the gallery last year, it became apparent that our priority is to unravel and present, the pioneering and historic works that she began making in the late 1960s and early 1970s leading up to today. Our first exhibition in London last spring brought together various works from the late 1970s towards the early 1990s. It presented the transformation that occurred in her language from the cosmic to the bodily, from abstraction to a type of figuration. Works that slowly and steadily started dealing with the body and the feminine, structures and forms that challenge paradigms in art; the Torn Heads, blown glass sculptures that portray different phases of Woman’s condition, as well as the thick pastel paintings of the feminine archetype: The Wife, The Medusa, The Lady as Bird, The Darkness. Lastly a body of sculptures, totemic at first sight, that combine industrial salvaged material on designed metal structures, hermaphrodite and female. The bold choreography of Conjunction of the Opposites: The Woman of War (1985) and The Lady of the Wild Things (1983) is an installation Lijn arrived to after a deep and long process of rediscovering the female. The two towering figures were realised ahead of their time as they are computer controlled, they employ LED lights along with laser, smoke and a combination of high and low materials such as brush hair. The connection between the sacred and modern industry is not an accidental one. Lijn observes that many of the holiest places consecrated to the Goddess in ancient times are now transformed into oil refineries and power stations and questions what archetypes might be hidden in the “bowels of steel mills or the endless intestines of oil refineries?” The two giant kore were made in different times and then became united; together they create a mesmerizing spiritual and sensual drama, staging an exchange of verses and lights in a cloud of artificial fog. The Lady of the Wild Things (1983), a bird goddess, represents the lunar archetype and as a machine gets activated by sound. Her head is made of a prism from a Centurian tank, her red and green wings are studded with 250 LED lights; she “represents life in death and death in life.” When Lijn made The Woman of Warsome years later (1986), a signing goddess that sings an angry, bold and audacious song, she made her also as an archetype. This song Lijn felt came straight through the earth to her mouth and she started singing it, it felt to her it was the Earth signing through her. She then realised that they were one. A laser light connects them as a disembodied red beam of light bouncing between their heads. When they are on their own they sleep, while when encountered a six minute drama unravels, one that is sung in Lijn’s voice. The two sculptures communicate on a symbolic level with references to female archetypes and mythological beings, embodied in elements of violence, seduction, power and spirituality. Facing each other, they completely reinvent binary notions of gender, establishing femininity as a fluid cosmic fact, which allows the integration and interchangeability of opposites on a physical and psychological level. The idea for this work dates back to 1959, when Lijn lived in Paris and saw in the sky the figure of the goddess made up of clouds. This goddess-like figure remained since then central to Lijn’s work and her attempt to deconstruct and reconstruct this vision lies behind a large part of her artistic production. A selection of drawings further elaborates on the complex symbolic and metaphoric discourse delivered by Conjunction of Opposites. Realized between the early 1980s and the early 1990s, these works on paper amplify the visual vocabulary of symbolic and formal references compiled by the artist and reveal the depth of her lifelong commitment to pursue a radical notion of femininity on a psychological, intellectual and artistic level at once. It has been a great honour to work with Liliane on bringing this historic piece to Rodeo, Piraeus to mark the beginning of the new season and the second exhibition here. A body of work that is 35 years old that could not feel more contemporary and urgent in a current state of affairs; a work that screams for transformation in a state of mind and openness towards realising a society where feminine power rises again.